Photos from the weekends racing for round two of the WDMRC at Willmot. 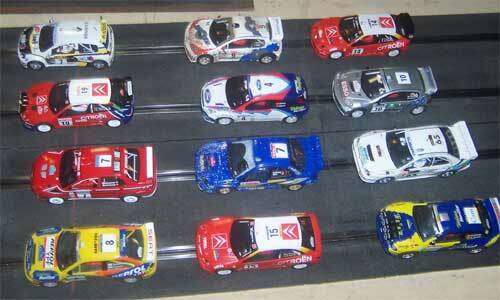 First up for the night was Restricted Rally Cars comprising of Scalextric SCX and Ninco Rally cars. Unfortunately the Ninco cars are disadvantaged as they must run NC1 motors which are outclassed on Willmots fast Ninco track. 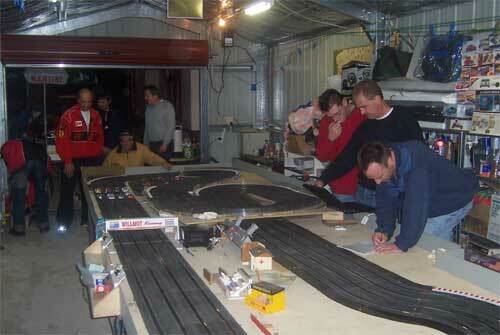 We ran a Restricted racing class also comprising of standard Open Wheelers. The Ninco cars again running NC1 which were not so disadvantaged due to the 24 tooth gearing they come with. Still no Nincos ran on the night although some tested beforehand. 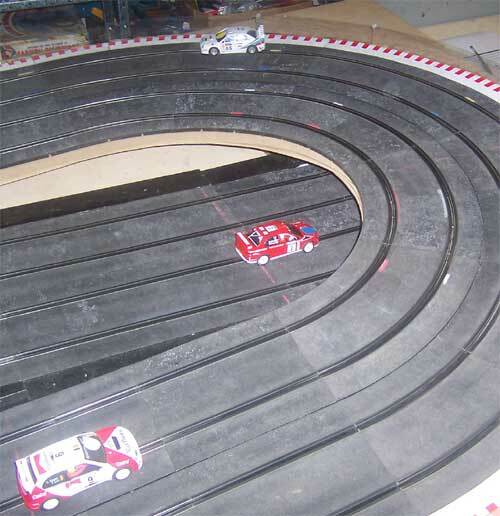 Daves white Ninco Subaru NC1 powered of course chasing Robs Scalextric Mitsubishi and being followed by a Corolla of parts unknown. Looking up the main straight. Down the back we have Jamie smiling for the camera, Bo in customary Ferrari jacket, lightening fingers Joe in customary end of straight catchers position. He is about to fit the catchers helmet as we wait for Daniel on right in red to turf another opponent into the weeds. Rob and Cameron behind Joe draw straws for the outside lane while Bump hovers over laptop and Graeme checks laptimes to find the fastest car to borrow. I was hiding behind camera too scared to show my face. Ah the life of a photographer. 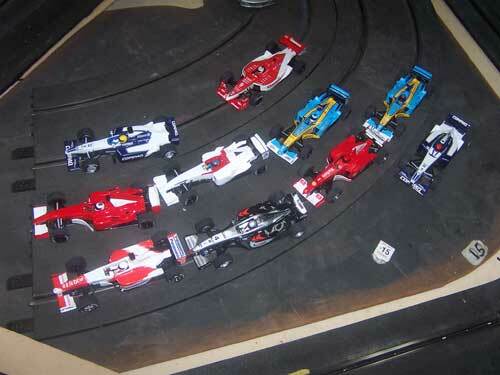 Some of the field of F1 cars that were to run for the night with a Ninco Indy posing alongside. All cars bar Bo's Renault ran 2mm magnets with the Williams and Mclaren magnets being repositioned to the same position as the later Renaults and Toyotas. This proved to even out the field somewhat although we are finding 25 ohm controllers would help the cars be more driveable. Bo's 1.5mm magnet lost him some cornering speed. 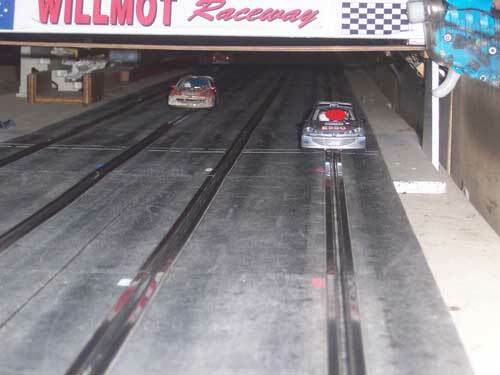 The cars are inconsistent due to the magnets catching on the rails where the track is not so even but the cars were in general closer together than last time. I can't post results as I cannot read them yet. Still to finish installing software on the new computer. It is hard to know how much but a Mabuchi is rated at 18000 rpm at 12 volts. An NC1 is rated at 15000 rpm at 14.8 volts. I am guessing we get about 19500 rpm at 13.7 v for a Scalex with 27:9 gearing that is a 3 to 1 ratio or 6500 rpm for the rear axle. The Ninco is around 14000 rpm at 13.7 v with 24:9 gearing that is 2.666 to 1 ratio or 5250 rpm for the rear axle. The Ninco tyres on the Indy car are a bit larger than the ones on the Scalex cars but the Scalex is operating above its rated voltage so The Scalex cars seem to pull away quite rapidly down the straight. 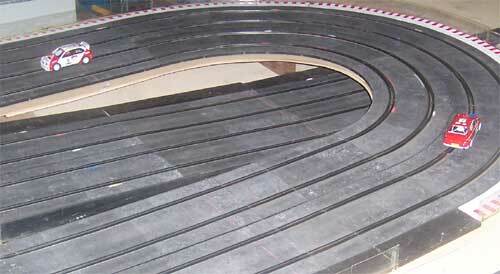 We tested the cars a while ago on a Tamiya dyno and the Scalex cars seem about 5 to 8kph faster. They don't reach top speed on the straight without a magnet but the Scalex cars pull about 500 mm out. My guestimates are just that but the rated rpms are correct. Next time I'll bring my camera, Vinno, and get your famous face in a shot, so the blokes can put a face to the name. My face is already up Jamie. Didn't you recognise my moustache?